A Sydney magazine entitled Foke recently published a humorous list of popular oxymorons, with “Business Ethics” coming in at number 13 (Foke, 2012) after the likes of “Government Worker” and “Exact Estimate”. It shows how deeply the disconnection between ethics and business has been ingrained into popular culture as a stereotype. It’s time to challenge that stereotype. 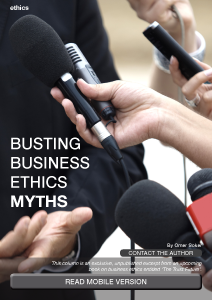 Business ethics is still marginalised and sidelined. It’s supported in principle by all and ignored in actions by most. We all think we are ethical yet we accept intolerable behaviours at work, and often participate in them just to fit in or to maximise commercial imperatives. Some of the unethical behaviours that have almost become a norm in companies include: avoiding blame for wrong-doing, dishonesty, breaking someone’s trust, coercion, favouritism, failing to consult, failing to intervene or report wrong-doing, having conflicting interests, keeping secrets, manipulating people, misleading communications, neglecting your duty of care, resisting investigation, reckless use of authority and being unkind or unfair. It’s hard to see how any of these value-destroying behaviours can actually help grow businesses or individuals, but they have been associated with successful commercialism for centuries. In the past, ethics was marginalised because it could be. In the 1500’s Machiavelli argued in his book The Prince that cruelty restores order and obedience (Machiavelli). During the Industrial Revolution in the 1800’s businessmen were able to ignore social justice to increase profits. In the 1980’s, “Greed was Good” on Wall Street (IMDB, 1987). Companies no longer have such control over markets, customers or employees. The Internet and social connectivity have armed consumers with knowledge, and the power to force companies to act transparently. Our global system is so inter-dependent, that our interests are becoming aligned. In the past, ethics was abused to divide and conquer. Today, ethics is the bond that restores trust, improves growth and strengthens the world economy. It is an enabler of success. It was the unethical behaviour on the part of stock brokers, investment advisors and mortgage lenders that caused the global financial crisis. They provided loans that they knew borrowers could not afford and that could cause massive losses to investors in mortgage securities (Commission). The financial institutions pushed these bad loans into the market because they had too much money on their books and had to lend it out to generate more profits. Their short term greed caused them to act unethically, regardless of the risk in the longer term. They acted unethically because they were making too much money and wanted to make even more money, despite knowing the consequences of their actions were likely to be catastrophic. How much did their greed cost? Estimates of the value lost from equities markets worldwide by the financial crisis range from US$34 trillion (Liu, 2010) to US$50 trillion. To put that into perspective, the size of Australia’s GDP is around US$1.5 trillion. In short, unethical business conduct destroyed an economy 20 or 30 times larger than Australia’s. Even the “mopping up” of the financial crisis cost an additional US$11 trillion, which is enough to finance a handout of US$3,000 for every man, woman and child on the planet (Conway, 2009). Prior to 2007, we bought into the idea that wealth creation and growth would be everlasting and that our economic model would keep us safe and prospering. That invincibility was exposed as a sham. We have more vulnerability than invincibility. Not surprisingly, people have begun to question the system and there is much anger. Many people who abided by all the rules now find themselves out of work and uncertain about their future prospects. According to the Commission, the impacts of the crisis are likely to be felt for a generation (Commission). High profile bankruptcies driven by unethical business conduct or linkages to the sub-prime crisis include Lehman Brothers (US$691 billion), Worldcom (US$103 billion), CIT (US$71 billion), Enron (US$65 billion), Conseco ($61 billion), Thornburg Mortgage (US$36 billion) and Indymac ($32 billion) (Ross), as well as the US$50 billion missing from clients of Bernie Madoff’s Ponzi scheme (Journal, 2008). The cost of the unethical conduct is causing consumers, employees, company leaders and investors to question the stereo-typical image of ethics. Now the world is watching. Armed with knowledge and social media, consumers are holding companies accountable to act with ethics. Spin is dead; Twitter killed it. Consumers have been burnt by too many corporate frauds and scandals, not to demand a move towards integrity. As consumers fully realise their new found power, they will increasingly wield it to change the way business is conducted. Companies cannot demand trust, they have to re-earn it. It is forcing companies to re-examine the role of business ethics as a growth driver, differentiator or competitive advantage.